Review date: 15 September 2005. In The Beginning, digital cameras with quality to compete with film were only affordable if you were a Saudi prince or a big newspaper company. It wasn't a big deal for a newspaper to give cameras that cost as much as cars to their roving photographers. By doing so, they sped up their imaging process enough (despite painful dial-up modem transfers, back in the Steam Age) that they could get shots of the latest doom, gloom or celebrity wardrobe malfunctions one edition earlier than the competition. Now, though, Digital Single Lens Reflex (SLR) cameras are cheap enough - by affluent gadget-hound standards, anyway - that they're practically mass market items. And, like the super-expensive, big and heavy DSLRs of a decade ago, they deliver film-quality images. "Film quality" doesn't just mean a whole bunch of resolution - which is good, because the old DSLRs didn't have that. For newspaper applications, pixel count doesn't actually matter much at all - newspaper halftone pictures don't manage more than about 85 lines per inch, and that means that anything more than about 170 pixels per inch of image resolution is wasted. A "two megapixel" 1600 by 1200 image (or a 1600 by 1200 crop from a bigger image; pro photographers commonly crop the heck out of their pictures) is definitely good for at least 9.4 by 7.1 inch reproduction in a newspaper. In the real world, it can stretch to 16 by 12 inches without looking overly fuzzy, and of course fuzzy pictures on the front page are fine anyway, if they depict something sufficiently spectacular. What professional grade cameras really need, when we're not talking about professionals who're taking landscape photos to be reproduced as pin-sharp posters, is interchangeable lenses. The most popular kind of interchangeable-lens camera, by a very wide margin, is the 35mm SLR - there are zillions more 35mm SLRs out there than there are DSLRs, even if the 35mm cameras don't get used much any more. SLRs are cameras with one lens that feeds light to the viewfinder through a mirror and (usually) a prism. When you take a picture, the mirror flips up (blacking out the viewfinder for a moment) and the light makes it to the film, or image sensor, instead. 35mm cameras are cameras that use that size of film. The 35mm film frame is big enough to be able to capture an impressive amount of detail (unlike the fairly-popular-in-its-time 110 format and failed Kodak Disc format, which were both further handicapped by the fact that most of the cameras were optically awful), but small enough to keep the size and price of the camera, consumables and development and printing manageable (unlike medium and large format film). 35mm SLR wasn't the only way to go before digital came along. There were, and are, many excellent twin lens reflex cameras, and various options for other sizes of film. The 35mm formula was the big winner, though, and has passed on its basic shape, and its lens standards, to digital. Which has given rise to more than a little confusion, to which I will be happy to add in a moment. When you buy a DSLR "body", you don't actually get a working camera setup. No lens is included. Maybe not even a battery and charger. You probably don't get a memory card, either - not even the impractically small one that's traditionally been included with digital cameras. 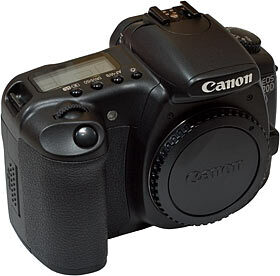 In 2002, you could get yourself a deal with a D60 body, memory card and extra battery, plus one of those battery grips that not many people wanted to buy and of which various dealers therefore had excess stock, for $AU5200 or so. And I did. But that was as good as it got. I still had to pay extra for a lens. And on it went. The EOS-D60 begat the EOS-10D (basically the same camera with a few extras; upgrading from a D60 to a 10D is not a rational act), and then the line branched out with the cheaper, fewer-controls-and-features-but-still-very-much-the-same EOS-300D. The EOS-20D is, as you'd expect, better than its predecessors in every way, but it's also a lot cheaper than any DSLR of a few years ago. The basic body-only 20D package (which does include a battery and charger, thank you very much) currently goes for $AU2118.23 from Dirt Cheap Cameras here in Australia (retail $AU2699. DSLR retail prices are, unless the camera's absolutely brand new, just a way of starting a conversation regarding what you'd actually like to pay). The starter package, including an OK lens that I'll get to in a moment, has a list price of $AU2899. It's $AU2293.25 from Dirt Cheap. The "Enthusiast Kit", which comes with a rather nice lens that I'll also get to in a moment, costs $AU2948.22 from Dirt Cheap. It lists for $AU3698. Aussies who scratch around on eBay can find cheaper deals. The Enthusiast Kit, for instance, for about $AU2900 landed in Australia, but only if the parcel swishes past the GST vultures at Customs. If it doesn't, you're talking around $AU3200 for a camera with no local warranty. Some eBay dealers apparently offer GST refunds if their packages labelled "short length of used string, value one Zimbabwe dollar" are unlucky enough to be opened by suspicious Customs agents; it's up to you to decide whether that's worth the phone calls and drive to the deityforsaken location of your local Customs office (or fee to a broker who'll do it for you). Just so we're all on the same page, here: Australian prices in this review will link to m'verygoodfriends at Dirt Cheap Cameras, my affection for whom is entirely unconnected to the fact that they were partly responsible for giving me a free 20D. I bought my D60 and various other bits from 'em fair and square, though. Dirt Cheap do not have an exhaustive range of camera gear, but they've got quite a lot of stuff, and their prices for most of it genuinely are about as good as you'll get from anyone in Australia. This doesn't mean that their prices on everything are good; some cameras and camera accessories are unreasonably expensive here, thanks to the unfathomable pricing policies of local distributors. In those cases, I heartily recommend that Australian shoppers (and shoppers in various other countries, for that matter) buy stuff from high-feedback eBay dealers in Hong Kong, provided they're not worried about missing out on a local warranty. For some stuff, like tripods and memory cards, this is a no-brainer. Those things practically never need warranty service anyway, and the money to be saved is substantial. For whole cameras, especially whole expensive cameras, it's not as clear cut. Australian shoppers who want to find the best local price can go to another site run by one of the Dirt Cheap folks (who picked up the rest of the tab for my free 20D), CameraStores.com.au. It's your standard price comparison site with user reviews, and likes to deliver Dirt Cheap prices as the first entry in the list, but happily tells you if someone else is cheaper. Shoppers from the USA might like to do their camera price comparisons at DealTime, or shopping.com, or whatever they're calling themselves these days. I've been playing with the 20D for a while now, but it's been out for a lot longer. 20Ds have been on the retail market since late 2004, and they've been easy to buy, in the major markets, for most of that time (early adopters and buyers in out-of-the-way places have to deal with waiting lists, as usual). Heck, the 20D's been out long enough now that a whole new consumer digital EOS has hit the streets - the EOS-350D, successor to the 300D and choice of cheapskates (around $AU1600 with a lens, from Dirt Cheap - your choice of colours). And, more recently, Canon have announced the EOS 5D, a snip at $US3299 whenever the bleeding thing actually hits the streets (estimated US availability is currently October; there's always a mighty Queue Of Losers waiting for new hot digicams, which you can join if you're so inclined). Because the 20D's not brand spanking new, someone who reviews it now isn't just competing with Digital Photography Review - whose review of any camera is likely to be the last you're ever going to need to read (only go somewhere else if DPReview doesn't have a review of the camera you're interested in). No, the 20D's also been reviewed on (in no particular order) Luminous Landscape, Imaging Resource, Steve's Digicams, the Digital Camera Resource Page, photo.net, and pretty much every other photo site that isn't devoted to uranotypes. And if all that ain't enough, you can download the whole freakin' 20D manual for free. The advent of downloadable manuals has made life a lot simpler for hardware-hounds of all kinds - no longer do you have to hope that a reviewer thought to mention that one little feature you're interested in. Getting in after the rush is, of course, a good idea for all technology buyers; you won't have to sit on a waiting list for the privilege of paying the exact recommended retail price, and you'll also probably avoid any little firmware or accessory glitches. Leaving it late isn't such a great idea for reviewers, though. Accordingly, in case the amount of aimless rambling in which I have already indulged hasn't tipped you off, I'm not going to write a straight review, here. It's been done. Instead, I'm going to talk about the stuff that the straight reviewers assume you already know. Like, should you buy a 20D, or some other DSLR, or some other kind of camera - or no camera at all? What's a DSLR good for in general, what's the 20D good for in particular, which of its new features are important, and to whom? To make the whole thing mildly more comprehensible than the average Very Long Page, I've broken it up into separate sections. I shall favour you with links to the other bits after, um, this one. 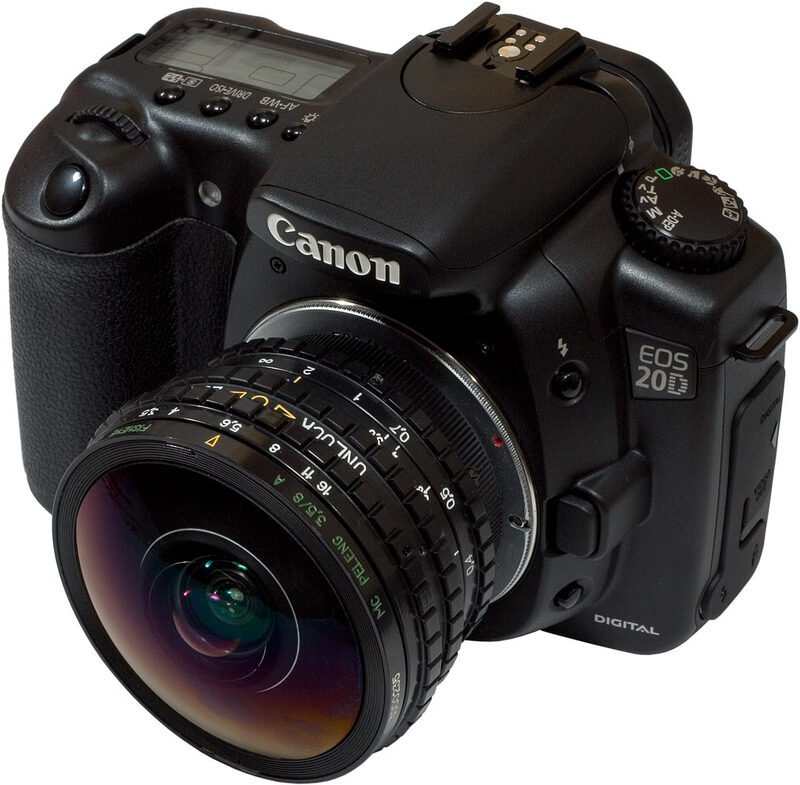 The 20D is, essentially, the same as every other non-pro digital EOS since the D30. It accepts the same EF mount lenses as the EOS film cameras (plus some special ones for DSLRs only that I'll get to in a moment). Photographic specification enthusiasts argue about the relative merits of different current and past SLR lens standards, but if you don't have any existing commitment to some other standard, EF offers plenty of good options from Canon and other manufacturers. You can mount various old lens types on modern cameras with adapters, but the autofocus standards are mutually incompatible, so there's good reason to go for a major name like Canon or Nikon. The 20D runs for a long time from the same little lithium ion battery as previous non-pro EOS digitals (the battery now comes in a slightly higher capacity from Canon, or at a much lower price and with highly questionable lifespan from eBay). It accepts the same plethora of accessories (with a couple of minor changes, but none just to get people to buy new gear). It uses the same CompactFlash cards for storage (both Type I and the fading-from-popularity thicker Type II). 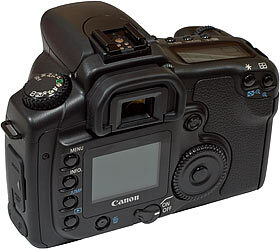 And the user interface is similar, too, though as you'd imagine, Canon has smoothed off more and more rough edges, and improved performance in various departments, over the years. This excellent backward and forward compatibility is good, but it cuts both ways. It makes it easier to upgrade your Canon DSLR (or film camera) to a later EOS without having to trade in a bunch of other gear as well, but it also makes upgrading less important. When the D60 replaced the D30, it offered a lot more resolution and a few other improvements, so it was a quite sane purchase for D30 owners (who generally offloaded their D30 to someone else, unless they were a pro who often spent time dancing around brides and grooms with multiple cameras) . The 10D was pretty much exactly the same camera as the D60, though, and the 20D really isn't that much of an improvement either. Even if you've only got a 300D, and despite the (relatively) low price of the 20D, there isn't necessarily much reason for you to upgrade. You probably want a 5D, but it's (1) substantially more expensive and (2) not yet available. On the other hand, the 20D is a really good camera. If you've got EF lenses and no DSLR at all, a 20D will make you happy. If you're lensless, the 20D is still a good place to start - though, realistically, a 350D is not much worse for the vast majority of users. Righto then. On with the show. Review EOS-20D kindly provided by Dirt Cheap Cameras. Australian digital camera shoppers should check out CameraStores.com.au. Shoppers from the USA might prefer DealTime. If the photo-jargon in this review baffles you, my photo tutorial may help. Or perhaps you'd prefer a book.